British metal trio Absolva have announced their headline European tour dates for September-October 2014. Absolva have just undertaken a tour in the UK which was the first leg of their “Anthems To The Dead” tour, promoting their 3rd album release (2nd studio album) which is receiving widespread critical acclaim…. The European leg of the “Anthems To The Dead” tour covers 8 different countries and 24 shows in total. The band has also been confirmed for Underwall Festival in Croatia in June, playing alongside Sepultura, Enslaved, Rage, Amaranthe & many more. It’s expected that further dates will be added. Meanwhile, on home territory the band headlines day one of SOS Festival in North Manchester in July, day two headlined by former-Dragonforce vocalist ZP Theart’s I Am I, plus extra UK shows in Oxford and Scotland. “Anthems To The Dead” was released on 5th May this year & features special guest performances on guitar by Doug Scarratt of Saxon and Luke Appleton of Iced Earth. Doug Scarratt has remained friends with Absolva frontman Chris Appleton after the two toured together a couple of years earlier, whilst Luke Appleton is Chris’ brother and former co-member of Fury UK. A music video “Never Back Down” includes footage showing both Doug and Luke in the studio and can be viewed at Absolva’s Youtube channel. The “Anthems To The Dead” album combines traditional and modern elements whilst embracing heavy, power, progressive and classic metal influences. As well as an exciting and accomplished rhythm section the album features the signature sound of Chris Appleton on lead guitar, increasingly regarded as one of the very best players in Europe, combining speed and feel. 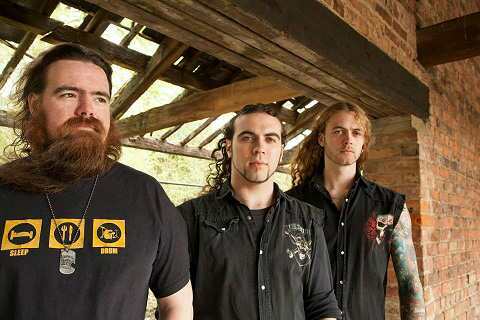 Absolva was formed in May 2012 from the ashes of Fury UK when Luke Appleton left to join USA metal giants Iced Earth. Lead guitarist and lead vocalist Chris Appleton, and drummer Martin McNee teamed up with Dan Bate (formerly of Point Blank Fury) and quickly secured special guest slots with Iced Earth as well as performances at Hammerfest and Bloodstock festivals. Debut album “Flames Of Justice” was released November 2012 and was welcomed with open arms by fans and critics alike, followed up quickly by a live CD and DVD “Beyond Live” released September 2013 and recorded at a sell-out 500 capacity show in Belgium. Special guests on the first 15 shows in September-October Tour will be Babylon Fire, labelmates of Absolva at Rocksector Records and themselves also achieving a growing reputation as one of the standard-bearers of British metal. The full tour schedule confirmed so far is as follows….